People often ask my parents, “Did you always want to have a big family?” When my Dad and Mom were married in the summer of 1984, they thought they would probably have two or three children and be done. However, the sorrow of a heartbreaking miscarriage with their second child caused them to have a heart change. Through this difficult time, they began to read in the Bible that children are a blessing and a gift from God (Psalm 127:1–5). It was then that they prayed and asked Him to give them as many children as He saw fit. A year later, God blessed them with twins! And then another baby, and another, and another! When my parents had 14 children, they realized that their family was outgrowing their home. Since they were committed to living debt-free, they made the decision to begin building a house themselves. It was during this time that a television network began filming regular shows about the things that our family was doing together. Fast forward a few years, and here we are! 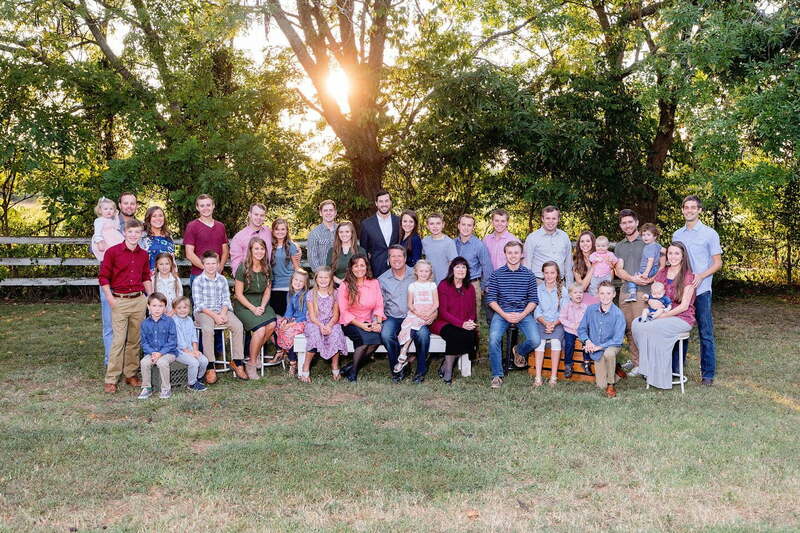 My parents now have 19 children (10 boys and 9 girls), sons- and daughters-in-law, and new grandchildren arriving every year. My family is far from perfect—we face challenges and struggles just like any other family! But through it all, our desire has been to make Christ known and for others to see that the Bible truly is the “owner’s manual” for life. Such a well written and wonderful tribute to your family, Joe. The Lord be with all of you. I love this family – each of their stories are very inspiring. One nitpick – “a couple” literally means two. Many people use it incorrectly to describe what would correctly be called a few or several. Your family didn’t add 5 children over nearly a decade in “a couple” of years. Great point Sarah, Thanks for pointing that out to us. We will get that fixed! Thank you both for loving and glorifying the Lord our God with your example of Christian living. Congratulations on your marriage and sweet beloved baby boy; he’s so adorable! Thank you for sharing your beautifully blessed family with us fellow Christians and…those in world. You’re a true model for what a Christian home/family should look like and I thank GOD for you. I’m praying others (especially) young adults will see, listen, and learn from your example. Kendra is such a cutie. I like this family and their good values. I especially like how Joe said his family isn’t perfect and has issues. All of us do. Families are very important. Thank you for sharing your love for them. I would love to hear about Kendra’s family too if possible.